Trenchard Brat. Flying Spanner. Left Hand Seat. Nicknames abound in aviation. But not many get to be called them all, especially when they’ve started life with an aversion to school and a stammer thrown in. Mick Patrick started his aviation career as an RAF Apprentice and finished it as an Air Ambulance pilot. He never knew he was going to become a pilot – just that he was determined to have a good start in life and it seemed the RAF offered this to him. As an engineer, Mick saw active service on jungle airstrips in the Far East during the Borneo Confrontation with Indonesia and got his hands dirty servicing Cold War aircraft. Later he had an opportunity to become aircrew as a Flight Engineer and it was from this position he was able to use his knowledge as part of a crew to take the next step. After many years of watching pilots ply their trade, Mick decided he could do it too, so worked his way up to becoming a commercial pilot. Along the way he experienced risky moments that shaped him as an aviator; he crashed a float plane in a Texas lake, flew casualties to Coventry and elephants to the East, nose-dived in Nassau and skirted death at Stansted. The tales in this book are used to illustrate how they affected Mick’s approach to aviation and what he took away from those events. 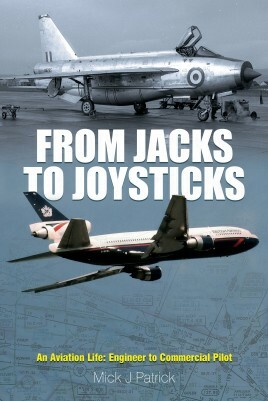 Immensely readable and delivered by a true story teller, From Jacks to Joysticks is for anyone who loves tales of aircraft and life in aviation, whether in the cockpit or on the ground. Above all else this book is about how a lifetime of exposure to aviation has shaped one man’s thinking and approach to life and how in aviation you need to keep an open mind. Mick Patrick has been involved in military and civil aviation for over fifty-seven years. Licenced as an aircraft engineer and commercial pilot on both sides of the Atlantic, his career has taken him through several airlines, until finally flying as an air ambulance pilot. Now semi-retired, he continues in aviation as a safety auditor and lives in England on the edge of the South Downs National Park near Arundel.